Dry-powder inhaler (DPI) is an alternative device to the aerosol-based inhalers commonly called metered-dose inhaler (or MDI) and help in delivering medication to the lungs in the form of a dry powder. DPIs are commonly used to treat respiratory diseases such as asthma, bronchitis, emphysema and COPD, although DPIs (such as inhalable insulin Afrezza) have also been used in the treatment of diabetes mellitus. Globally, increasing number of people with respiratory diseases and diabetes mellitus are expected to remain the growth drivers for dry powder inhaler devices during the period of study. Geographically, North America dominated the dry powder inhaler devices market driven by a world class healthcare infrastructure with a technologically advanced practice, higher spending, a high number of people with respiratory problems, strict guidelines and presence of key industry players in the region. North America was followed by Europe and Asia-Pacific as second and third largest market for dry powder inhaler devices market. Asia Pacific is projected to have the fastest growth, owing to a rapidly developing medical infrastructure, increasing spending on healthcare and growing medical tourism in developing nations such as China and India in this region. This report identifies the dry powder inhaler devices market size for the years 2014-2016, and forecast of the same till the year 2022. 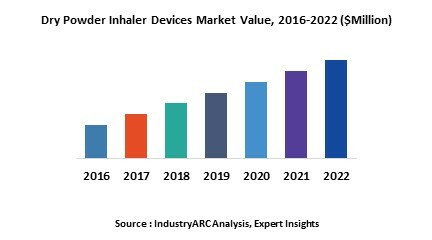 It also highlights the market drivers, restraints, growth indicators, challenges, and other key aspects with respect to the dry powder inhaler devices market. 14.5. Teva Pharmaceutical Industries Ltd.